Following the New Year announcement that British rock legends IRON MAIDEN and independent family brewers Robinsons have teamed up again to create a special beer in support of Help For Heroes, a British charity which provides lifelong support to those with injuries and illnesses sustained while serving in the British Armed Forces, Light Brigade, a unique golden English ale with a 4.1% ABV, is now available online and debuts in 270 Morrisons stores nationwide. Light Brigade is the fifth beer in the Trooper family and is available in both cask and 500ml bottle formats. Morrisons was the first U.K. national retailer to stock Trooper when it was launched almost five years ago. With over 20 million pints now sold worldwide, it seems highly appropriate that Morrisons is the first U.K. supermarket operator to stock this latest innovation, in 500ml bottles, across 270 of its stores. 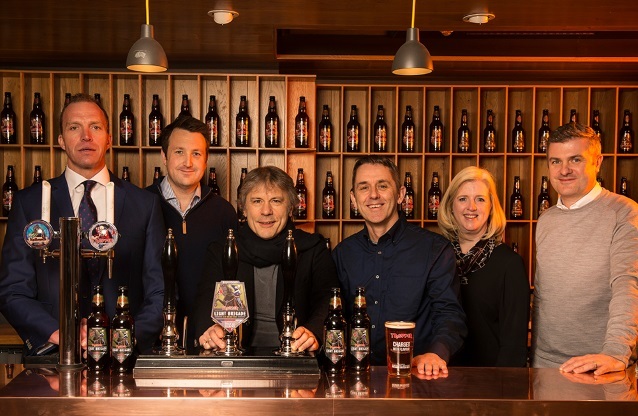 The collaboration between the three iconic British success stories and partners in Light Brigade is a natural fit: Bruce Dickinson, IRON MAIDEN‘s vocalist, loves his real ale, has a well-known interest in British military history and is a supporter of Help For Heroes; Robinsons Brewery is one of Britain’s most established and respected independent family-owned brewers with 180 years’ brewing experience; and Help For Heroes is an internationally recognized Armed Forces charity (marking their 10th birthday this year). In keeping with the Trooper brand, band mascot Eddie is featured on the bottle label on horseback in a uniform that was worn by the British cavalry at The Charge of the Light Brigade, which took place in 1854 at the Battle of Balaclava in the Crimean War. In addition to brewing the beer, Robinsons will also be organizing a calendar of charity events across their 280-strong pub estate, including taking part in Help For Heroes 563km Big Battlefield Bike Ride which will travel through historic battlefields and commemorate 100 years since the end of the Great War. Light Brigade is now available to purchase nationwide in 270 Morrisons stores as well as online at www.robinsonsbrewery.com.